It’s such a rare thing to make a professional career out of football in India, one always lose hope after a certain age due to afraid of losing jobs, lack of family support or mainly financial issues. 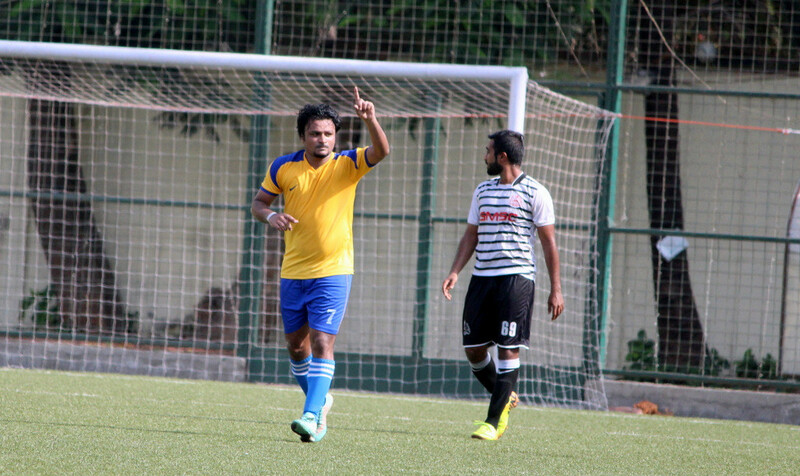 Few keep surviving and fight for their dream irrespective of any barriers on their way, one of them is Mumbai born Karim Shaikh who has been playing for one of the most popular clubs in Mumbai, Central Railways in the topmost division of Mumbai football. Two months ago, Karim inspired his team Hirai Suns FC to win their maiden title after defeating Flash FC 3-1 in the final of Colaba Sports League 2016. “You have proved again that you don’t go home empty hand after a certain tournament,” Sudhakar Rane (MDFA’s Assistant Secretary) told Karim after the final. Born in Colaba, Mumbai, Karim always dreamed of becoming a professional footballer right from his childhood. He had already set his sights on following his dream rather than to give up and opt for another profession at an early age. Back in his school days, Karim always used to visit Cooperage Ground in the evening to get a glimpse of the local division matches which was contested there. “As I stayed near Cooperage Ground, I always used to go there after leaving from school to watch local matches. It didn’t bothered me whether it was 3rd division, or 1st division matches. It had become my habit to always spend my evening at Cooperage Ground, that is what made me a huge fan of the beautiful game at such an early age,” Karim told me during our long conversation at his place. Just beside the main field of Cooperage Ground, there was a small mud ground (now, car parking area) where Karim started to play football along with his friends. That’s when Nelson Sebastian, an AFC Licensed Coach spotted him playing. Nelson selected Karim for Bipin Memorial Cup in the 1997-98 season where his passion, abilities, skills were showcased in front of whole Colaba which made him quite a famous guy back then. Karim kept maturing as a player after playing alongside senior players like Anil Pawar and Rashid Shaikh who are currently playing for Western Railways and Central Railways, respectively. Both Anil and Rashid are hugely respected for playing a huge part in helping young players from Colaba to develop. While growing up, Karim always looked Chirag Sheikh and IM Vijayan as his footballing idol. Karim studied in Holy Name High School (Colaba), and somehow went on to make his school famous in the MSSA games after some brilliant performances. In 1996, he was deservingly selected in the U-12 school team when he was just 10 years old, and soon became the Captain of his team after impressing the management. ‘Little Karim’, as he was known as back in his school days due to his small height went on to play in U16 Nationals side when he was nearing his school exit. Later in 2004, Karim once again played Nationals where Maharashtra suffered a narrow 2-1 defeat in the semi-finals against Bengal. After completing his school in 2002, Karim joined 1st Division side Dena Bank which turned out to be a big breakthrough in his career. Karim adapted himself quickly and became one of the integral part of his side. He also helped Dena Bank to gain promotion in the Super Division, and later they went on to win the Super Division title too. Karim was named Super Division’s best player of the tournament in 2003-04 for a fantastic season. What was sheer passion and dedication, Karim admitted that he used to travel from Vasai Road to Cooperage Ground at 05:30am for practise while he was in Dena Bank. It was solely his dedication that has made Karim what he is today. In just two years at Dena Bank, Karim proved that he is ready for much bigger challenge. His brilliant stint for Dena Bank also got him a call to represent Maharashtra in Santosh Trophy. Karim’s next move was to Golden Gunners who used to play in MDFA Elite Division. There he was reunited with Rashid Shaikh, and alongside top players like Nagesh Swamy, Sarfaraz, Shanawaz and Reuben D’Souza, Golden Gunners managed to finished 3rd in the Elite Division. One thing Karim kept on mentioning during our conversation was how thankful he is to have Sudhakar Rane (Sudha Anna) and Krishna Pawle by his side. Karim once again decided to change his club as he joined Elite Division side Central Railways in 2006 where he is still a player. It’s been 10 years now, but Karim has decided to continue creating more memories in the yellow jersey. It was Francis Fernandes who brought Karim into the team, and according to the latter he is the best manager/coach he has played under alongside Derrick D’Souza. In these 10 years, Karim has won many titles with Central Railways which includes three bronze medals in Inter Railways Football Championships. In 2006, Karim was unfortunate to see his father passed away due to cancer. But Karim never looked back, and always followed what his father had instructed him. “Had I didn’t get any support, I wouldn’t have been here. My family supported me throughout each and every time. My father used to say me that it’s more important to be a good human being than to be a good footballer, that’s one of the reason I have always helped and guided my juniors. Karim has represented Celtic Bandra and Boombastic in various private tournaments where he has successfully made his name. He has stated that while he was playing for Celtic Bandra, they had the best possible team at helm. “Franco (Francisco Salin), Mathias Coutinho, John Coutinho, Anil Pawar, Reuben D’Souza, Vijith Shetty, Steven Dias, we had the best possible team whenever we used to play. It was quite difficult to defeat us at that moment. Karim believes that it makes him feel successful if someone smiles while watching him play football. “It’s very easy to make people cry, but very hard to make them smile,” a quote by Karim’s icon, none other than Ronaldinho.